Virginia Tso is a beadmaker from Pinedale, AZ and we have been offering her work on our website since 2009. She has been making handmade beads since the 1970's. This squash blossom necklace is made with stamped, oxidized handmade beads with fourteen "blossoms" on the strand. The naja is a beautifully cast piece with an Art Deco-style crest at the apex of the naja. 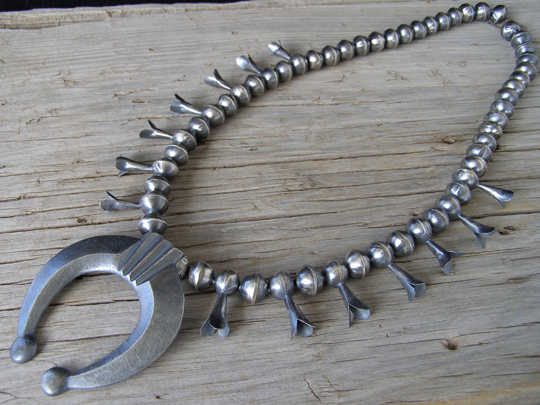 This has a wonderfully primitive aspect of early Navajo jewelrymaking and Virginia gave this a splendid patina. Naja: 3" x 2 5/8"